Otherwise dubbed (by me, anyway) as the life changing magic of using things up, the hashtag empties is one of the most soothing things on Instagram. I am obsessed with decluttering (and it’s counterpart, recluttering), but I often feel a deep sense of dissatisfaction with the degree of waste I see that accumulated in my life. This is why I’ve always favoured selling my things online; not only is it a nice side hustle, but I feel like the item is purchased because it is being used, not just being sent to rot in a Salvation Army store somewhere. This unfortunately doesn’t apply to beauty products. My poor mum has been the victim of many a well-intentioned clean out. As has the rubbish bin. 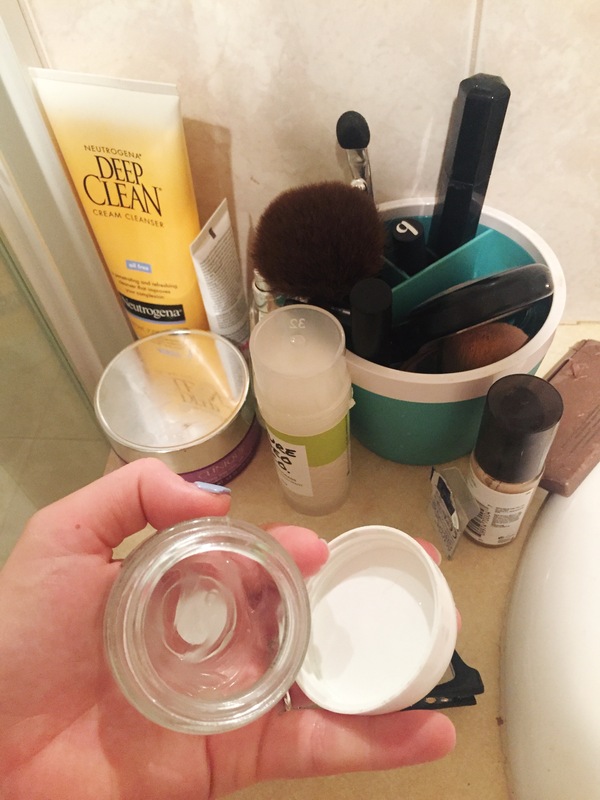 But I am very proud to declare that today, I actually created my very own empty – I used up a Garnier hydrating face moisturiser all the way to the final gooey scoop. And what is such a declaration without a photo to back it up? There it is, in all its glory, an extremely empty moisturiser container. I cannot even explain to you the sense of satisfaction that that container did not go to waste. When I was reaching the final dregs, I did resist the urge to just spread the stuff on every inch of my body, just to be done with the darn thing. But I reminded myself it was a game; a test of the deeper effects of delayed gratification and satisfaction in true consuming, not just waste. Of course, this is far from the only moisturiser in my cupboard. I can now move on to working my way through the next poor tub of goo, slowly but surely getting every drop and maximising it’s value. It’s weird – but I encourage you to scroll through the #empties on Instagram. Embrace the feeling of properly using something up, of pushing through the sense of boredom with what you have to learn to appreciate that you have it at all. Reflect on the joy or lack thereof it brought you when it’s done. And then say goodbye. While there is so much joy in a fresh start, there is great sense of self-discipline and achievement in seeing something to the end. And I believe that holds true, whether for a life altering path, or a small tub of moisturiser. And hey, you have to start that journey somewhere, right? It was a typical Melbourne day in December, and I was walking through my own real life version of the Sisterhood of the Travelling Pants, going with my high school girlfriends to get our nails done in preparation for my best friend’s wedding that weekend. We had had every conversation under the sun, and still didn’t run out of things to talk about. And after talking boys, and reunions, and gossip, and weddings, and mothers in law, and dreams, we arrived at skin care. And praise the damn lord. The bride to be had the clearest skin on the planet, and I wanted in. Another girl spoke up, talking at great length about the intricacies of balanced and careful skin care, and we all got on board, ready to commence our skincare journeys, to say goodbye to caked layers of foundation and the seventeen-year-old-self shame of another red angry pimple exploding its way into the middle of my face. I felt my skin had become exceptionally terrible since working full time, sitting in the harsh fluourescents and the constant air conditioning and the makeup and the bad food (probably all also attributable to the ever-growing flub around my bod). I gave my friend licence to instruct me what to do and when to do it, and now that I’m also wearing a pretty diamond on my left hand, she has been appointed official Wedding Skincare Consultant. The goal: that I can walk down the aisle with skin so glowing it doesn’t need makeup. The process: was kickstarted with many many text messages. I’ve shared the bespoke program designed by my ever-excellent Wedding Skincare Consultant below. We began with the fact that I am impossibly lazy and often don’t bother to remove my makeup at night (I know, I know, I’m awful). I was instructed to purchase Clinique’s Take The Day Off cleansing balm. The balm is used every night when removing my makeup (since I wear makeup every day). I use two fingers to scoop up some of the balm, rub it between my two forefingers, then gently rub it into my face using a circular motion. It is an extremely unattractive process as my mascara ends up all over my face, but I’m reassured that unlike all my other useless makeup removers, it actually gets rid of the mascara and all of the foundation. The balm is really gentle, so my skin also feels like it’s being cared for, unlike the alcohol-based removers I’ve used in the past. Like many girls I know, I love a good trip to Priceline, an impulsive purchase of a set of three cleansers / toners / moisturisers that are on sale and in cute packaging, only to use it for a few days and let the set gather dust in the back of my cupboard. I’ve never dedicated much time or effort to consider the ingredients and what will best complement and service my skin. My all-knowing Wedding Skincare Consultant prescribed two cleansers to begin the skincare journey to glowing perfection: the Clinique Facial Soap in mild (not the foaming one) for the morning, and Neutrogena’s Deep Clean Cream Cleanser for night. The Clinique facial soap is also available in extra-mild, but I figured my skin could do with a bit of extra help. It is a gel cleanser, which I was informed is best for the morning or after exercising, when you’re looking for your face to feel fresh and hydrated. I was also under strict instructions to avoid any gel cleanser with foaming, as it contains bad alcohols for the skin and dries you right out, doing you no favours when it comes to the later stages of skincare journeys in hydrating. I’ve used the facial soap every morning when in the shower (probably cheating, but it was the only way I could think of to build using the cleanser into my daily routine so I didn’t forget or get lazy), and definitely feel that it is refreshing and like my skin is actually getting a proper wash. My only gripe is the container I got has a fault pump, so I need to unscrew the lid and tip it into my hand. Once I’ve used up a body wash that has about six drops left, I’m planning on pouring it into that. I’ve been surprised by how bloody annoying this fault is, but obviously it isn’t insurmountable. I’ll just be paying more attention next time I purchase. The evenings are for the cream cleanser. Potential products included the Neutrogena mentioned above, the Neutrogena Ultra Gentle Hydrating Cleanser, La Roche-Posay Toleriane Dermo Cleanser, L’Oreal Age Perfect Cleanser Milk, CeraVe Hydrating Cleanser, Yes to Carrots Daily Cream Facial Cleanser or A’kin Pure Creamy Cleanser and Toner. My decision was based on the not particularly discerning process of selecting what was available in my closest Priceline. The purpose of selecting a cream cleanser for the evening was that (and I quote), ‘your skin has been out fighting the elements all day and it needs a hug and some loving in order to repair itself’. I use the Neutrogena cleanser after Taking Off The Day with my Clinique. The creaminess really does feel amazing after a long day, and I go to bed feeling like I’ve finally done my skin a favour. Now that I’d built the foundation of actually cleaning my face, we approached the more serious steps of addressing hydration. This is the real key to progressing in the skincar ejourney apparently – as no other issue can really be fixed until your skin is hydrated. The primary contributory factor to my failed skin is the pleasant office environment of too much air con and dry heat. This has caused my skin to lose all moisture and oils, then it has gone into overdrive producing more oil,. causing pimples. The dehydration can also be blamed for the fine lines all over my face (that plus the fact somehow I’m six months away from turning 27). I was prescribed Hydroluron by Indeed Labs, a serum that tackles dehydration. This product is super popular, so I wasn’t able to pick it up in any of the Pricelines in Perth CBD and instead ordered it online, most likely fuelling the reception’s thoughts that all I do all day is shop online. This serum locks in the hydration that comes from the moisturiser you have to apply afterwards. And I’m looking forward to saying goodbye to my annoying fine lines, and actually feeling like my skin likes me. Okay, I couldn’t actually think of the right title for this section. But this final product was purchased to help attacking the fact that pimples keep poking their way onto my face and making me feel irritated. Serozinc by La Roche-Posay is a toner that you spray on your face after cleansing, which helps skin heal and rejuvenate. I have ended up leaving mine in the kitchen since you can also spray on during the day if my skin is feeling hot or tired for some extra hydration over makeup – so now everytime I walk through the kitchen I see the blue bottle and give my skin a spritz. I have faithfully purchased every product, and committed to following my routine. I’m exceptionally proud of for the nights when I was too boozy to remove my contacts, but faithfully took off the day, thoroughly cleansed and moisturised. I never miss a morning cleanse, and generally I think I’m seeing some positive progress towards being that dreamy glowing bride I long for. Keep an eye out for future stage installations and updates on my skincare journey! From the second I saw the Emily Ley line of planners, mainly The Simplified Planner, on Instagram, I fell in love. The clean, crisp lay out, with tidy, well-organised font and luxe paper just spoke to me. 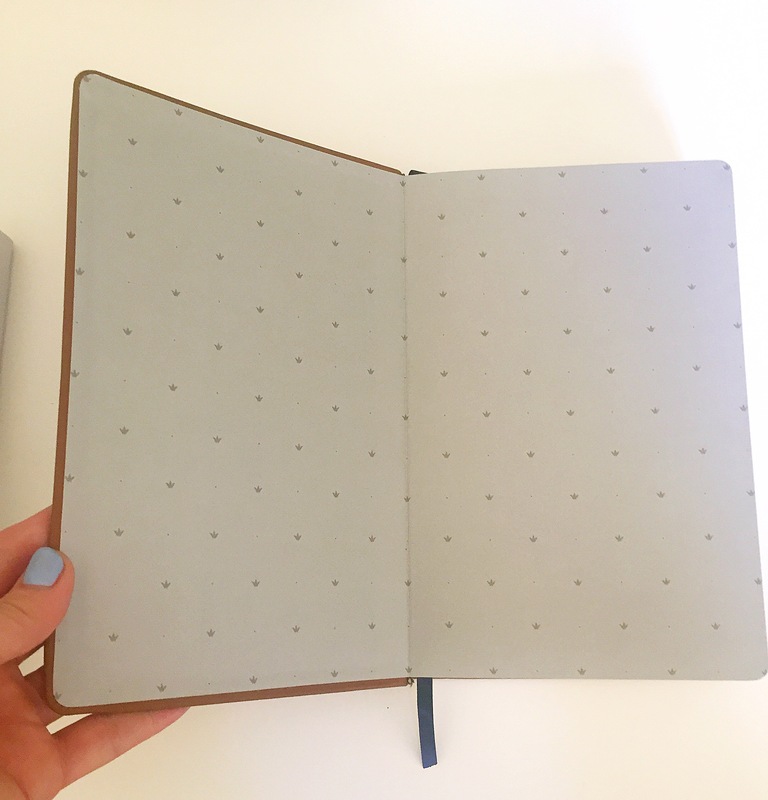 The daily spread of half time/appointment-related information, and half to do list, with plenty of space, it’s perfectly with how I like to and choose to plan, and would alleviate the need for the more pain-staking approach of bullet journalling. 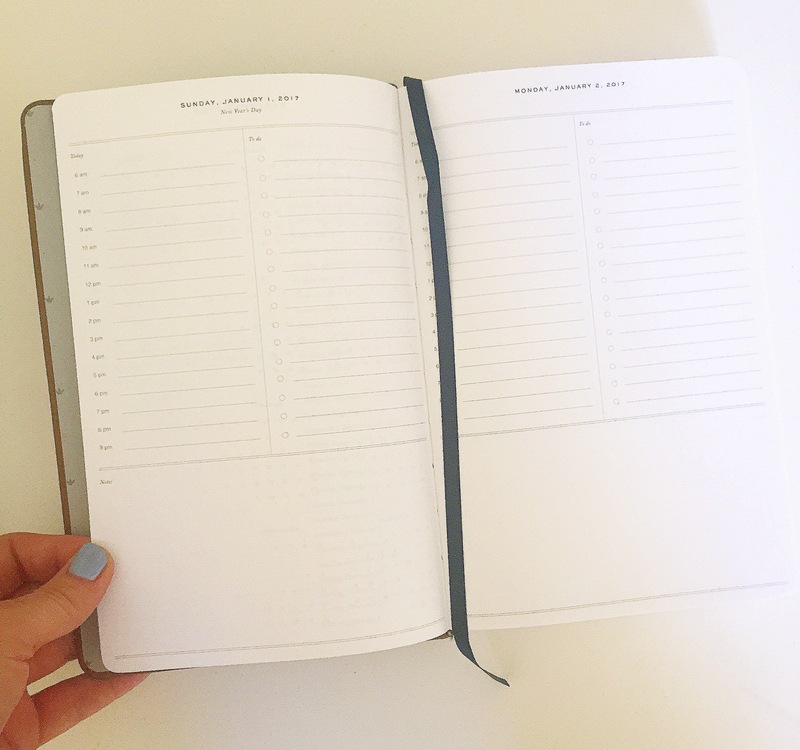 The Simplified Planners were gorgeous, but I tend to prefer non-spiralbound style planners. 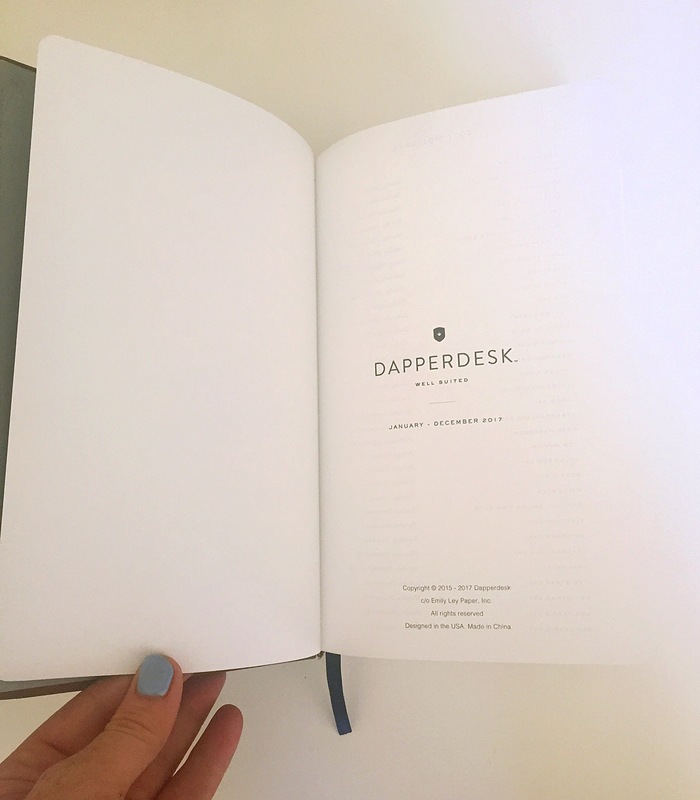 So I sighed in relief that I was saving myself from another planner splurge, until I discovered the Dapperdesk range. 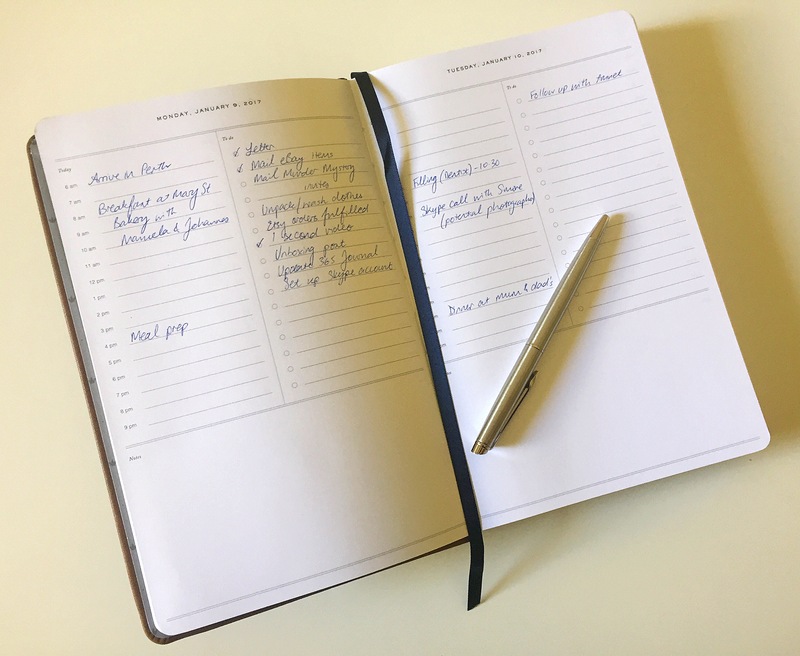 Styled as more of a planner for him, the Dapperdesk planner is a leather-covered perfect bound planner, with all the same interiors as The Simplified Planner. 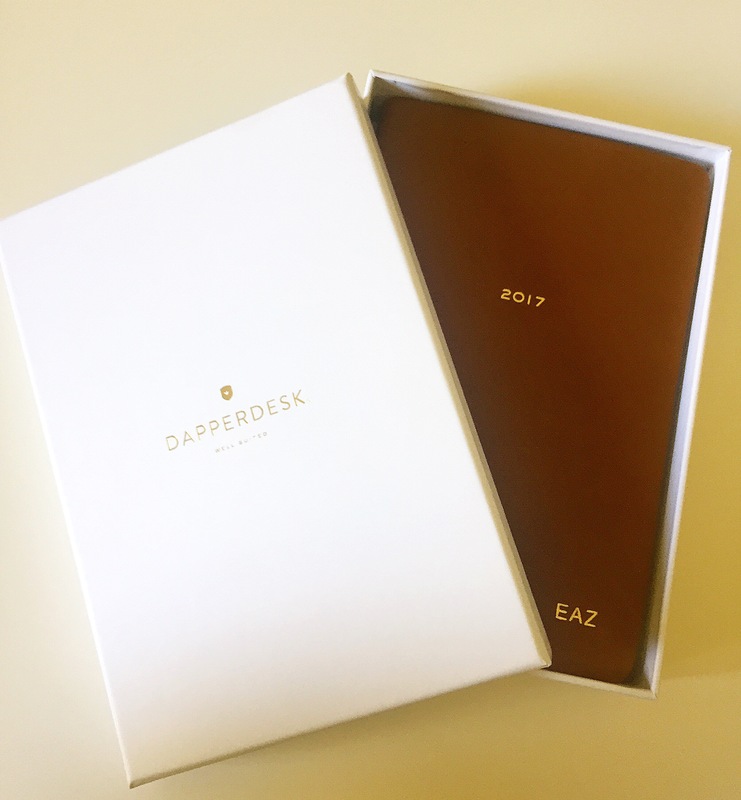 I agonised for ages, but couldn’t justify the high price of shipping from US to Australia – so I was totally thrilled when my future in-laws generously splurged on the 2017 Dapperdesk planner for a very unique and special Christmas present. 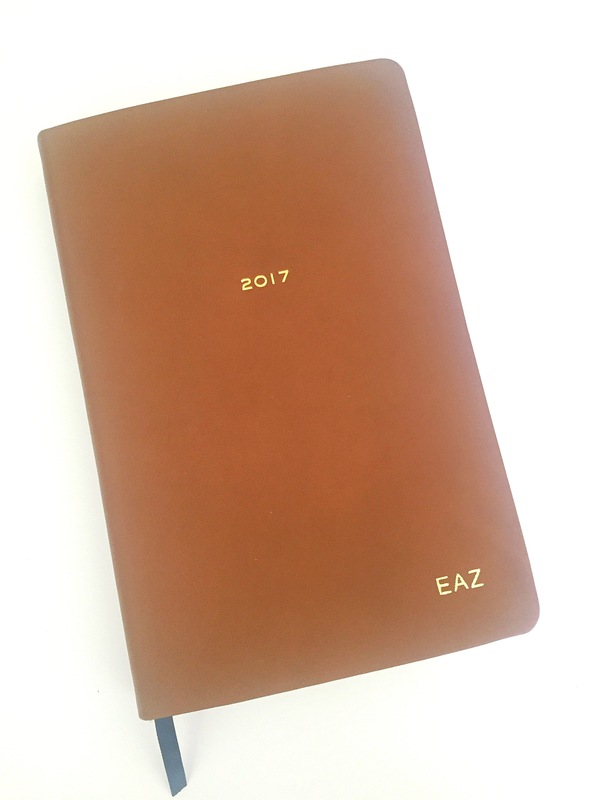 The soft brown leather with gold monogramming makes this one very classy planner. While the cute covers of The Simplified Planner are really fun, this style fits more with me generally, and will look really classy at work. The paper is an absolutely beautiful weight and quality, and I could take photos fast enough to get to the good part of writing. The inside covers are a lovely soft grey pattern. And you can see the daily layout style in the picture below. So clear and easy to populate! I find this layout really intuitive and gives a lot of options for the planner to function as a brain dump as well as something to actually help and assist. However the paper is absolutely stunning, and it felt really special to write on each page. What really works for me with the Emily Ley style planners is how you don’t feel a need to spend time decorating each page. Don’t get me wrong, I love a good stickering session as much as the next person, but I can find it impractical for my work and sometimes a beautiful layout does not necessarily go hand in hand with functionality. So, that was a lot of pros! Beautiful quality, beautiful paper, beautiful presentation and beautiful layout. The cons? This planner will set you back a cool $75USD + shipping (ouch). 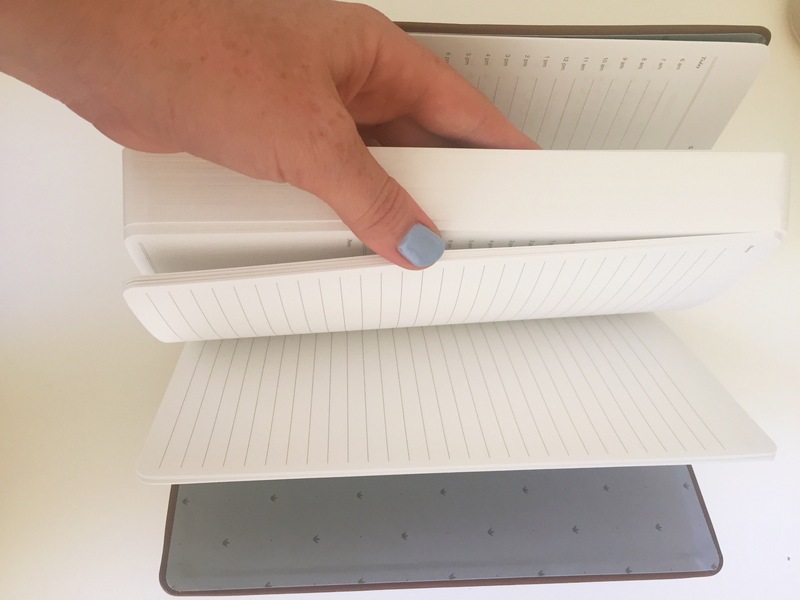 It is also quite large and bulky, so you either need to have a decent sized handbag, or know where this planner will be living permanently. I know some people find the hour-layout a bit restrictive and in that respect, it may not work for everyone in terms of customisation. But for me, this planner is about as close as it gets to perfect. I can already see myself coming back to this style year after year. I’d love your thoughts on the Emily Ley, and Dapperdesk in particular, planners.